What's in a name? A lot, social scientists think, especially if that name suggests a person's racial identity, which often, it can. During the last decade researchers have increasingly banked on the idea that a name can be a powerful signal of a person's race. Several hundred studies from social scientists and psychologists, have used "black-sounding" versus "white-sounding" names to uncover varying levels of discrimination via blind "correspondence audit" experiments. The studies have examined how often employers respond to black versus white job applicants based on the name on the resume, or how a perception of race from a name can affect the response rates for people who are hunting for a home, attempting to acquire health care or emailing politicians. A study published in the journal Sociological Science by UCLA sociology professor S. Michael Gaddis suggests that the aforementioned body of evidence often operates under a misguided assumption that all black-sounding names will send the same racial signal, when most often a black-sounding name also carries a cue to the person's social status. Past studies using names as a racial signal have either failed to describe the method of selecting names or have shown relatively arbitrary methods of choosing black-sounding versus white-sounding names, Gaddis said. It's important to examine the methods of choosing names to signify racial discrimination, because it's hard for researchers to study race and gender discrimination using surveys, he said. "When you ask people about racial inequality, almost everyone says they would never discriminate, there is virtually no variation," he said. "Even if people are prone to discriminate based on race, either consciously or not, they are very wary to talk about these issues openly even with researchers. We call it social desirability bias." Gaddis' study also suggests that researchers who use names to signify race have a lot of power to potentially skew results via name selection. His goal is to inspire fellow researchers studying inequality to be more rigorous about how names are selected for the increasingly popular and cost-effective correspondence audit. These studies rely on how people respond to resumes or email correspondence, rather than sending a racially diverse group of individuals into the world to apply for jobs or homes or health services. For his study Gaddis first looked at names he found in nearly 20 years of birth records from New York state. With this he could examine names commonly given by black or white mothers and the average levels of education of those mothers. He also was able to acquire the raw data from more than a dozen previous research projects dating back to the original and most-frequently cited related study in 2004 from economists Marianne Bertrand and Sendhil Mullainathan. 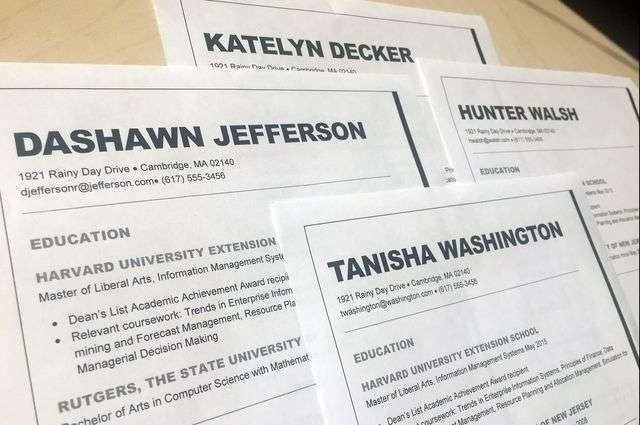 Their research showed labor market discrimination against resumes with black-sounding names. Gaddis included names from this 2004 study and others that followed it, combined with the birth record data. Then he compiled a list of 80 white-sounding and 80 black-sounding names to test. Using these names, he conducted a survey experiment through Amazon's Mechanical Turk, a crowdsourcing microtask marketplace. He asked respondents which race they would assign to each name on the list. He asked the question several ways—using first name only; by combining a black first name with a predominantly black last name (based on U.S. Census data); combining a white first name with a white last name; and by mixing white and black first names with white and black last names. Gaddis found a difference in responses to names that black women from different socioeconomic backgrounds gave their children, which suggests there is another factor at play when an observer perceives a black-sounding name. For example, in his study, the name most-commonly and correctly judged as a black-sounding name was "DaShawn." This name was also most-commonly given by black mothers with a high school degree or less. Names most-commonly given by black mothers with a college education, such as "Jalen," were much less likely to be associated as a black-sounding name. So these names do not always convey race in the ways that researchers have previously assumed, Gaddis said. "Only commonly given black names from lower social status origins are a strong signal of a person's race. We are sending signals of both social class and race when we use names like Lakisha and Jamal." In discrimination studies, researchers wield a lot of power by choosing names to signal race and may uncover less discrimination than actually exists. For example, a 2015 study led by University of Missouri professor of public affairs Rajeev Darolia that compared just four names, two white sounding (one male, one female) and two black sounding (one male, one female), showed no discrimination among employers and was widely cited by the media, often touted as positive racial progress. But, Gaddis points out the first names those researchers chose to identify as black were "Chloe" and "Ryan." For the racial signal they relied entirely on the last names of "Washington" and "Jefferson." According to U.S. census data, a majority of people in the nation who have these last names are black. The researchers tried to avoid signaling social class along with race and specifically chose to use generic first names with black last names, Gaddis said. "I understand what they were trying to do, but I'm not sure we should make a strong conclusion that racial discrimination was not prevalent based on those two names," he said. A popular black name from Gaddis' study, based on birth records was "Bria," but it was one that confounded survey respondents to correctly identify racially, Gaddis noted. "If you were to set up a study comparing Bria versus Alison, which is commonly and correctly identified as a white name, you may not find discrimination, not because it doesn't exist, but because Bria isn't a strong enough signal of blackness," he said. It's good to take a step back and think critically about these methods, Gaddis said. "We shouldn't pretend we are infallible," said Gaddis, who is currently working on a book about the method and will present his research at an upcoming conference in Amsterdam. "It's nice to understand where we might be wrong or show bias. Research won't improve unless we examine our methods. I conducted this study to make research on discrimination more methodologically sound in the future."